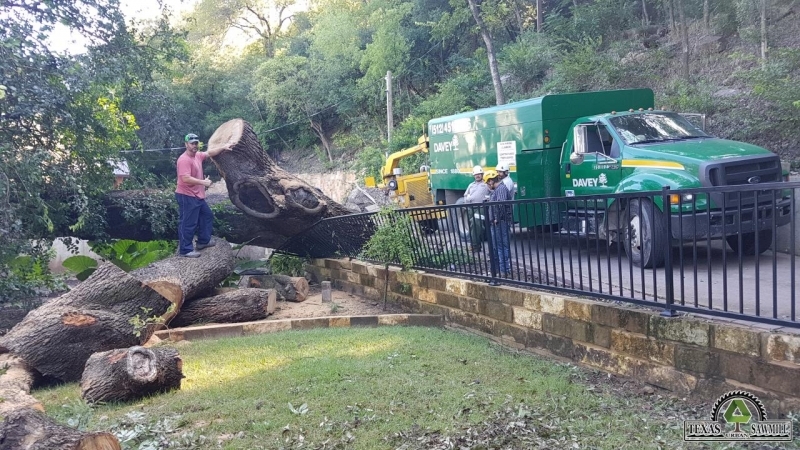 We helped support the Davey Tree Service company on this very challenging live oak removal in Austin, TX. This majestic tree had fallen during a September 2018 severe thunderstorm that hit the Austin and surrounding areas. 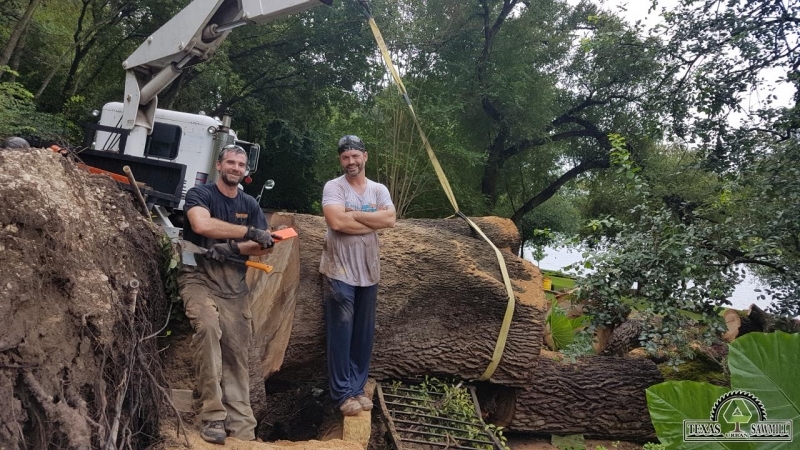 After a lot of blood, sweat and tears, we were able to successfully reclaim nearly 50,000 lbs of historical hardwood from the main trunk and two main limbs. 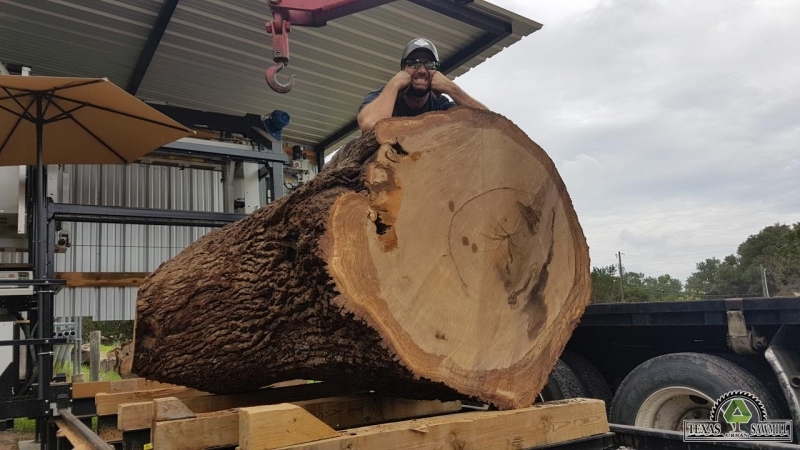 The main trunk measures 53″ in diameter near the root ball and tops off at over 74″ wide at the main upper crotch! Normally this tree would have been cut up into small sections, chipped and burnt up as firewood. This would have released 30 metric tons of CO2 equivalents back into the atmosphere (~6.4 cars of annual CO2 emissions). Instead, we have a much better solution! We will re-purpose the timber into urban lumber for fellow makers to produce historical hardwood furniture. One of the biggest challenges was access to the tree itself as the private road was not design for large trucks. Luckily, we had a few extra inches of space which allowed us to back our truck into place near the downed tree. Our next challenge was the removal itself. Our crane has a lift capacity of 9-tons, and we were not totally confident that we could cut the main trunk into a whole 8 foot section and lift it safely. Well, we got lucky as the trunk maxed out our hydraulics but we were able to successful lift, load and transport the log. The tree’s date of birth dates back prior to the Independence of the United States of America! When we put the age of these trees in perspective with historical events, we find people begin to view these dead and fallen trees differently. These fallen trees are NOT waste products. They are part of our rich history and can be re-purposed into valuable assets for future generations to enjoy. We need your help and support in spreading this philosophy so please share this story. Saving Trees! Improving Lives!